Bormioli Rocco 7 Piece Dedalo Whiskey Set [007236/025361]. This Bormioli Rocco decanter and wine glasses set,is from the Bormioli Rocco Italian glass makers. Coming all in one boxthis is the perfect gift for friends, family and even for Christmas. RANGE OF DECANTER SETS! ONE DAY ONLY OFFER PRICES!! SEALS AND PRESERVES- The Globe Trotter etched globe spirits decanter boasts an airtight seal to maintain the flavour and freshness of your high-end spirits or wine. Also included is a stainless-steel funnel, to easily transfer your beverage into the decanter without spillage. 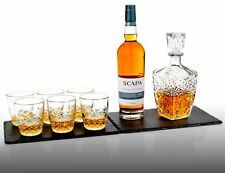 Beautiful Whisky Decanter Bar Set ideal for wine sherry or Whiskey. Guests stylishly serve whiskey or other drinks. Pet Supplies. Italian Glassware @ Special Introductionary Price !!! Manufacturer: LSA International. Range: Bar. LSA International Bar Whisky Set. Bought as a gift. Never used. Whiskey decanter plus 4 tumbler glasses. In original boxing, decanter never opened. Glasses box opened but in perfect condition. Collection only. One Decanter 650 ml /23 oz. 1 X Decanter 650ml/23oz. Four Glasses 320 ml / 11 oz. Set of 5pcs-Decanter and Old Fashioned Glass Set. Stylish Design With Sparking Wedges and Diamond Cut. BarCraft by Kitchencraft Cut Glass Whisky / Drinks Decanter & 4 Tumbler Gift Set. 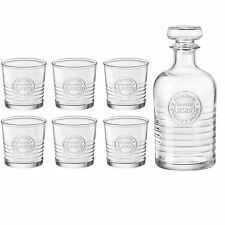 Decanter Set of 6 Glasses 260 ml Bottle 800 ml Whiskey Jim Liquor Stopper Clear. 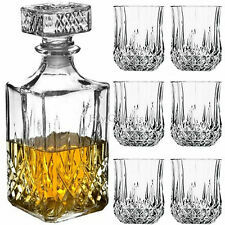 7 Pcs Whisky Decanter Set. Set Consists of 6 x 260 ml Glasses and 1 x 800 ml Decanter with Stopper. The Distinctive Cutting is Inspired by Cracked Ice. For Gin, Port, Sherry and Whisky, the collars are. —- A matching set of four Decanter Collars. On the reverse of each is MADE IN ENGLAND. When choosing an luxury and sophisticated-looking decanter, the aesthetic value of the drink is also increased, creating a better impression in the mind of the drinker and acting as an attractive decoration on the dining table. Set of four Wade Bells Whiskey decanters. All in good condition. Antique/vintage Double glass Whiskey/Brandy decanters/ set silver plated basket.